Several months had passed since their WildLink expedition, and Kingsburg students decided they wanted to get back into the wild for their Wilderness Ambassador Project. Kingsburg teachers, WildLink alumni, and their families and friends headed to Oakhurst for a hike. Light rain made the colors in the forest seem exceptionally vibrant as the group spent the afternoon hiking on the Cedar Creek Trail. There were many downed trees along the way from recent snow storms in the Sierra Nevada mountains, so at times the hike turned into an adventurous scramble over trees and branches. The group finally ended up at a beautiful waterfall. They even practiced a bit of stewardship by working together to move some logs off the trail. After admiring the immense amount of water coming down the falls that is characteristic of Spring in the mountains, they headed back and had lunch. 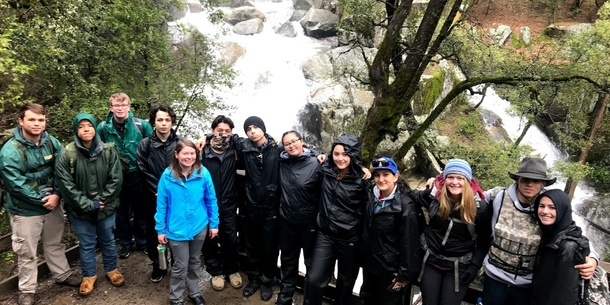 As is the case for many WildLink groups, the group headed back to Kingsburg with new knowledge that hiking in the rain and in less than ideal trail conditions can sometimes be even more fun than a sunny, easy hike!